There are various web document services like Google Docs and Zoho which serve as , and allow users to create documents, edit and manage online. The recently announced Web Document by Box.Net is another web document services that allows users to create, edit and share simple document online. The Box.net Web Document is quite similar with regular Microsoft Word Documents except it not features with downloading to view and are much smaller in size. The users can add tables and images, control complete text formatting like font size, alignment, spell check, printing documents, and even embed YouTube videos and other media. 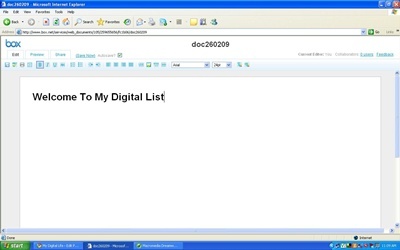 In addition, it also has option to make the document private or public that is depend on the individual needs. The usage of the Web Document may useful for create project documents for teams, write or edit essays from anywhere, share press releases or other business documents and etc. To use Box.Net Web Document, register and sign up for a new Box.net (aff) account, and then activate and create the Box.net Web Document here.